People around the world enjoy flowers in their food. Asian cuisine, for instance, relies on lilies and chrysanthemums, squash blossoms are common in Italian and Latin cuisines and the French used carnations for Chartreuse, a traditional liqueur. Rose petals and rose hips are popular with home cooks and professional chefs alike. While the petals provide only small amounts of nutrition, they do add benefits for you beyond their actual food value. Because petals contain about 95 percent water, their nutritional value is limited and their calorie count is low. However, the petals do contain some vitamin C, though less than that found in rose hips, the fruit of the rose that appears after the flowers drop. Ancient Chinese medicine used roses to treat digestive disorders, the pain from injuries and menstrual irregularities. Eating a varied diet full of interesting foods is the best way to ensure that you get plenty of vitamins and minerals. Adding rose petals to your repertoire allows you to explore new cuisines. Middle Eastern cuisine, for instance, uses rose water and rose petals in a variety of dishes. Try Persian stuffed dumpling squash with rose petals from Epicurious.com or Moroccan peaches from the Rhode Island Rose Society, listed in the Resources section. Cooking with rose petals and eating rose petals can make you feel good. Leon Seltzer, a clinical psychologist writing in "Psychology Today," explains that the delight of discovery, of being spontaneous and adventuresome, can make you feel good about yourself. Eating rose petals may seem like a trivial activity, but if doing so reminds you to savor your food and your life, it will take on a deeper meaning. In eating, as in life, establishing connections with the past is important to your well-being --- witness the feelings that arise when you eat pie made from your grandmother's Thanksgiving recipe or the beef chili that you know generations of your Texan relatives have enjoyed since pioneer days. Eating rose petals will transport you to ancient Rome, where roses were added to foods when a celebration of victory occurred. You'll also travel to the White House in 1899 where the chefs made pound cake with a glass of rose water according to "The White House Cookbook." The petals contain volatile oil, tannic acid, coloring matter, saccharine matter, mineral salts, and salts of malic and tartaric acids, etc. In addition to substantial proportions of vitamin C, rose petals contain other chemical amalgams, which comprise 11 per cent of pectin and three per cent of a mix of malic and citric acids. Researchers are of the opinion that the presence of malic acid and citric acid are the reason behind the laxative and diuretic effects. Due to their strong and pleasant fragrance, rose petals are used for making essential oils and perfumes. 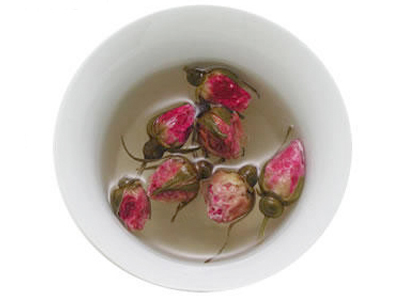 The infusion prepared from the rose petals is used to alleviate cold and flu symptoms. The infusion is also effective in treating sore throats, runny nose and congested bronchial tracts. [TIN Pyramid Teabags] Tea Rosebud Flower Tea 5 out of 1 5 based on 2 ratings. 2 user reviews.